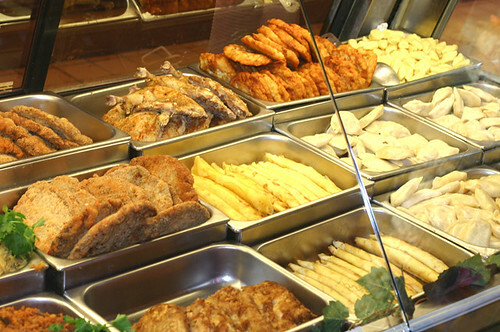 Gene’s is a great place to hit the pause button on all “low-fat” diets. It is located not far from our home. 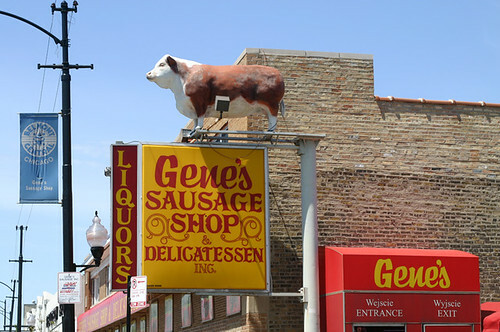 When you walk into Gene’s the first thing that hits you is the smokey scent of cured meat. 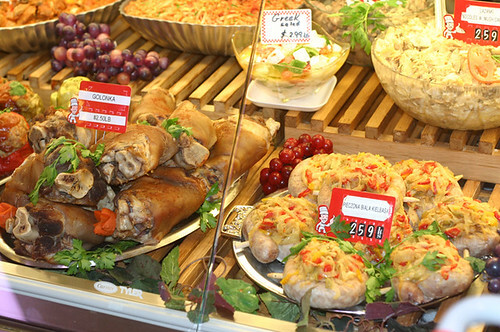 Their store carries over 90% European products and specializes in made-on-premises smoked meats and have over 40 varieties of sausages and hams and deli meats—and a full-service butcher shop. 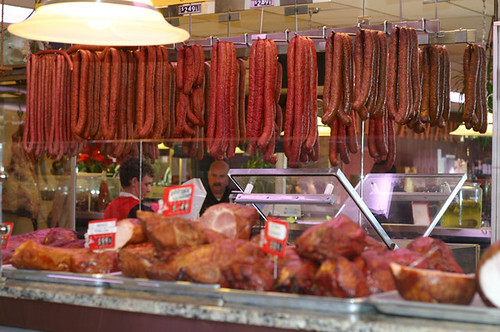 There is the usual selecton of deli meats but the main attraction is the wall of sausage. Along the back wall there are over two dozen strands of various smoked sausage. Our favorite style is the double smoked. It cooks well because it is not over powering in recipes. 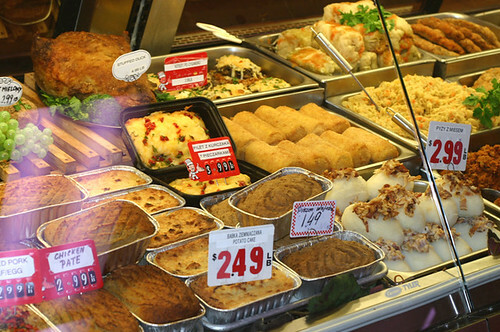 The large deli case has, made on site, various ethnic ready to eat items like perogie’s, forced meat loaves, stuffed cabbage rolls, potato pancakes, Swedish potato sausage. . . . they even make their own sauerkraut out of the barrel. The Pols are very aggresive when it comes to getting served at the deli counter. I learned one Saturday morning that you never get between a Pol and their deli. Any hockey player would marvel at what a seniored customer with a walker will do to get to the deli case when their number is called. Maybe it is the cold war tactics honed post WW II. Gene’s other great treat is the “Chicago bacon”. This is a man treat that makes OscarMeyer look like bologna. 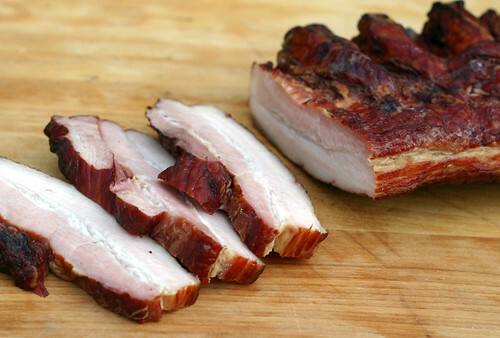 The Chicago bacon is a five pound loin that is cured to prefection. The loin can be cut into bacon steaks for a super breakfast meal. It was also our Christmas treat to the family this year. 90% of Gene’s grocery products are from the mother country. This plus the barrel of salted herring next to the polish style beer. At check out you meet non-english speaking cashiers that have no smile muscles. They must remove them before they leave Warsaw. Wow! This looks like a great place to buy all those delicious cured meats. Everything looks so good! Awesome products here! Especially that yummy looking Chicago bacon! Oh, Chicago Bacon!!!!! How we love it!!! Great post, John! Wonderful pictures! I felt like I was there! What a treasure that butcher shop is! I am sooooo jealous we have nothing in florida like this…unbelieveable, the art work behind the wonderful foods in a deli! awesome selection! My younger son Leo is a sausage fanatic. How this happened to a vegetarian mom is beyond me. His eyes opened wide when I showed him the pics in your post, especially the giant piggy sign. This is definitely his kind of place! Listen to your son Robin – SWINE RULES!